Topics from the golden legend in early modern England to the development of ultra-fast data analysis in medical genomics were explored at the second Caius graduate research conference, Caius to the Future. Following the success of last year's inaugural event, graduates at Caius organised a second afternoon of interdisciplinary treats. 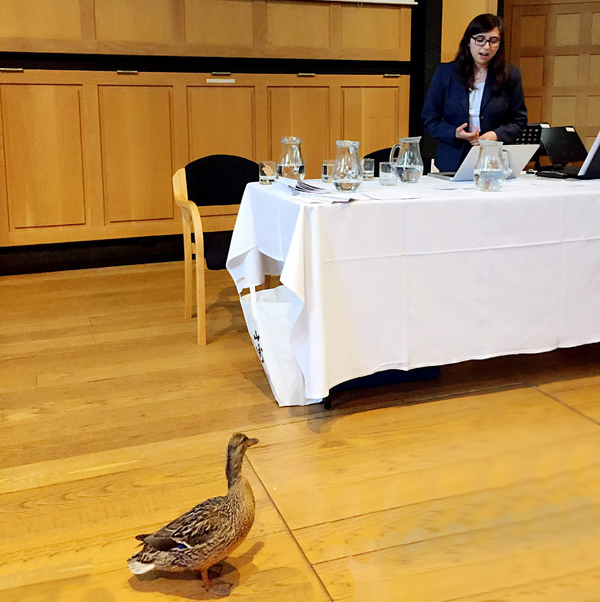 Featuring papers from nine graduate students, poster presentations from eight others, and keynote addresses from the SCR's Joe Herbert and Jeremy Prynne, the conference again showcased the thriving research community at Caius. Its aim is not only to provide an opportunity for individual graduates to present and explain work in progress but to encourage members of the graduate community to enjoy a taste of their fellow students' research - possibly in a discipline far removed from their own. The series of talks and presentations also offers graduates a chance to gain experience presenting their work to a wider group, including those who are not experts in the same field. Held in the Bateman Auditorum at Caius on the afternoon of Sunday 8 May, the conference featured three paper sessions together with poster presentations in which students use a small exhibition as a focus for informal discussion of their work. The first paper session featured Wiktor Olszowy on the topic "Comparison of a novel periodogram-based method with the FSL routines for fMRI experiments", Pierre Haas on "Skin-changers at the microscale: a theory of shape shifting droplets" and Morgan Ring discussing "Rewriting the golden legend in early modern England". In session two, Guo Yu spoke on the theme "Are you following? Agency and expectation in rhythmic human- computer interaction", Dannielle Cagliuso discussed "The whole matter of interference microscopes is... becoming rather complex: Sir Andrew Huxley and the design and dissemination of his custom interference microscope" and Peter Townsend gave a talk entitled "Memory friction, coloured noise and diffusion of isolated atoms at surfaces". The final session featured Alex Shattock on "International law and the Ukraine crisis", Marcus Klarquist exploring "Big data in medical genomics: developing ultra-fast computational frameworks" and Jennifer Jones addressing the theme "The future’s bright: modelling perovskite-polymer film structures for lasers". Keynote Lectures were given by two Caius Fellows: Professor Joe Herbert, speaking on the theme “The adult brain makes new neurons: why this matters”, and Jeremy Prynne on "Lyrical Persons." The event concluded with a wine reception and buffet dinner.